Features team logo on front and S and P on rear as the jersey number. Size 3.5" tall by 3" wide. Team logo/mascot with team color. 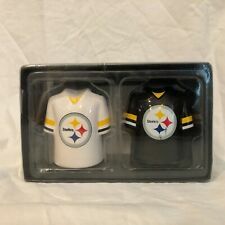 Up for sale are these new Pittsburgh Steelers NFL set of 2 NFL Jersey ceramic salt and pepper shakers. 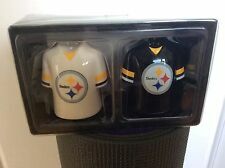 -Looks like a team jersey and features a colorful logo on the front and the word "Salt" or "Pepper" on the back. 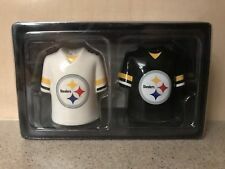 A SET OF SALT AND PEPPER SHAKERS. FROM THE TEAM SAN FRANCISCO 49ERS. I am not responsible for the delay due to. I am not here to cheat any one or take any one’s hard earned money. If this is the case and you still want the item.